Introduced in 2002, the V-Strom 1000 expanded the popularity of motorcycles in the adventure category. When a more proficient V-Strom 1000 debuted in 2014, it was also embraced by riders around the world. To maintain leadership in this category, Suzuki applied new technology and practical experience to the 2018 V-Strom 1000 and now adds a host of tour-ready features to the 2019 V-Strom 1000XT Adventure. Always a good citizen, the V-Strom 1000XT Adventure has innovative systems to maintain engine performance and great fuel economy while achieving worldwide emission standards. To emphasize Suzuki’s adventure heritage, the V-Strom’s styling hints at its lineage with a renewed call for adventure. That fresh styling also contributes to functionality and joins the unique Motion Track Anti-lock* and Combined Brake System and other features to bring rider assist technology to a new group of adventure riders. Like every V-Strom before it, the appeal and value of the 2019 V-Strom 1000XT Adventure will be recognized by experienced and enthusiastic riders. If you want to enjoy a trouble-free adventure as well, join them on a V-Strom. The V-Strom’s Anti-lock Brake System (ABS)** has Suzuki’s unique Motion Track Anti-lock and Combination Brake System. This system aids rider control during sudden braking, even in corners, and will help the rider continue cornering on the originally intended line. This advanced ABS system adjusts brake pressure during upright riding with other pressure adjustments when the motorcycle is leaning to either side, so the stopping force matches the available traction. Information about the motorcycle’s attitude is continually measured by a Bosch five-axis IMU. Sensors on the front and rear wheels continually measure speed. The wheel speed and IMU measurements, plus the amount of brake lever or pedal pressure, are calculated by the ABS control unit to instantly adjust the fluid pressure to the brake calipers as required. Additionally, this combination system can apply rear brake pressure when the front brake pressure reaches a certain point to help stabilize the vehicle. This increases stability and maneuverability during cornering. The rider has customary, independent control of the front and rear brakes unless a situation occurs to activate the anti-lock or combination braking features. Thanks to the new, advanced ABS control unit, the amount of kickback from anti-lock function to the lever and pedal has been significantly reduced. Suzuki debuted its first motorcycle Traction Control System* on the 2014 V-Strom 1000, and a new-generation system is employed on the 2019 V-Strom 1000XT Adventure. Suzuki’s Traction Control System lets the rider control the throttle with more confidence in a variety of riding conditions. The Traction Control System continuously monitors front and rear wheel speeds, throttle opening, engine speed, and transmission gear. It quickly reduces engine output when it detects wheel spin by adjusting ignition timing and air delivery. The rider can select one of three modes (1, 2, and OFF). Modes 1 and 2 differ in terms of sensitivity. Mode 1 has lower sensitivity; it allows a certain degree of rear wheel spin for good road conditions. Mode 2 has higher sensitivity; the system engages traction control sooner and is for poor road conditions. The distinctive fairing design is achieved by a straight styling line from the tip of its beak back to the fuel tank. This is a sharp and aggressive refinement of the Suzuki DR-Big inspired appearance. The height- and angle-adjustable windscreen has a new shape and is 49mm taller than the prior V-Strom's screen. The windscreen was developed through extensive wind-tunnel testing to reduce wind noise and rider fatigue. Suzuki’s patented mechanism allows the windscreen angle to be easily adjusted by hand. The advanced chassis is the foundation of a compact, lightweight adventure-ready package that provides comfort and enjoyment to a variety of riders. The aluminum, twin-spar frame was designed with the latest FEM analysis technology. It is stiffer and 13 percent lighter than that of the previous-generation V-Strom. The fuel tank has a generous 5.3-gallon capacity, and the back portion has been slimmed at the seat junction for rider comfort. The sides of the seat use a high-grip texture cover. The V-Strom’s slender chassis, thanks to the narrow V-twin engine design and trim seat, helps the rider’s legs to reach to the ground easier than other models in the class. The 43 mm KYB inverted front forks provide a sporty yet plush ride in diverse conditions. The fork legs have adjustable spring preload plus compression and rebound-damping force adjusters. The single-shock, link-style rear suspension features rebound-damping force adjustment plus remote, hand-operated spring preload adjuster. Tokico Monoblock, four-piston front brake calipers are mated with 310mm floating-mount dual discs. These efficient calipers are connected to the new Motion Track Anti-lock** and Combination Brake System for strong stopping performance. Spoke-style wheels feature tough, anodized aluminum rims and stainless steel spokes. Fitted with tubeless dual-purpose radial tires, these strong wheels are compliant enough for real adventure riding. Large-diameter, tapered-style handlebars have handguards with large damper weights for economic comfort and reduced vibration. A lower engine cowl, rugged accessory bar, and centerstand offer protection and convenience. 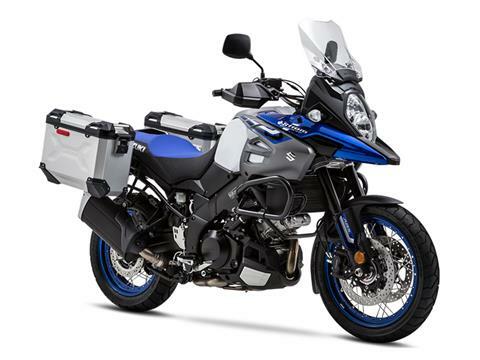 The V-Strom 1000XT Adventure is ready to tackle any road, as it is equipped with Suzuki’s new, ADV-style, 37-liter aluminum panniers that attach to powder-coated, stainless steel carriers. Fashioned out of 1.5mm thick aluminum plate with super-strong, no-pierce rivet technology, these new panniers offer a number of features, including hinged lids that stay in place when open, internal and external tie-down points, plus keyed stainless steel latches and quick-release hardware. Built to be waterproof with rubber-sealing lids, these panniers have powder-coated interiors that avoid aluminum stains on cargo. The charging system uses a durable, three-phase stator with an open-style regulator/rectifier that reduces mechanical drag and heat while producing higher output at lower engine speeds. The multifunction instruments include an analogue tachometer and a brightness-adjustable LCD speedometer. LCD readouts include an odometer, dual trip meters, the gear position, the coolant and ambient temperatures, the voltage, the riding range, the average fuel consumption, the instantaneous fuel consumption, the traction control mode, a fuel gauge, and a clock. LED indicators include ABS and traction control alerts, plus a freeze warning icon. This alert, together with the air temperature display, warns of possible icy road conditions. The rider can switch between traction control modes and LCD readings using the left handlebar switch. The left handlebar switch can also reset the trip meters. A 12-volt DC outlet is conveniently located below the instrument panel. This fused SAE socket is ideal for powering a GPS unit or charging mobile devices. The bright, halogen 65/55-watt headlights have the distinctive vertical configuration seen on the Hayabusa and GSX-R sportbikes. Rear tail and brake light uses LEDs, which offer higher visibility and excellent durability. The turn signals use bright, incandescent amber bulbs with clear lenses for superb visibility in traffic. New-generation Suzuki heated handgrips have multilevel heat adjustment that can be operated via the rider’s thumb (without removing hands from the handlebar). The four-stroke, liquid-cooled, DOHC, 1037cc, 90-degree, V-twin engine is designed to deliver outstanding performance across the entire powerband. The perfect primary balance provided by the 90-degree L-twin design negates the need for any balancer shafts or rubber mounting, as the engine has smooth power pulses. Pistons were engineered with use of FEM analysis to achieve ideal rigidity and weight. Suzuki Composite Electrochemical Material (SCEM)-plated cylinder bores are integrated into the upper crankcase for low weight, increased durability, reduced friction, and excellent heat dissipation. Twin throttle bodies with Suzuki Dual Throttle Valve (SDTV) system provide precise throttle response and boost torque at the low- to mid-rpm range, while still producing peak performance. The EFI system employs 10-hole injectors on each throttle body to improve fuel atomization for superior combustion efficiency and frugal fuel consumption. Advanced 32-bit ECM also operates the Automatic Idle Speed Control (ISC), which improves cold starting and stabilizes the engine idle. The ISC on the V-Strom 1000 has Suzuki’s Low RPM Assist feature that seamlessly adjusts engine speed during takeoff and low-speed riding to smooth the power delivery and to help reduce the possibility of the rider stalling the motorcycle. The refined, single-silencer exhaust configuration reduces weight and has a lower center of gravity to enhance handling and maneuverability. 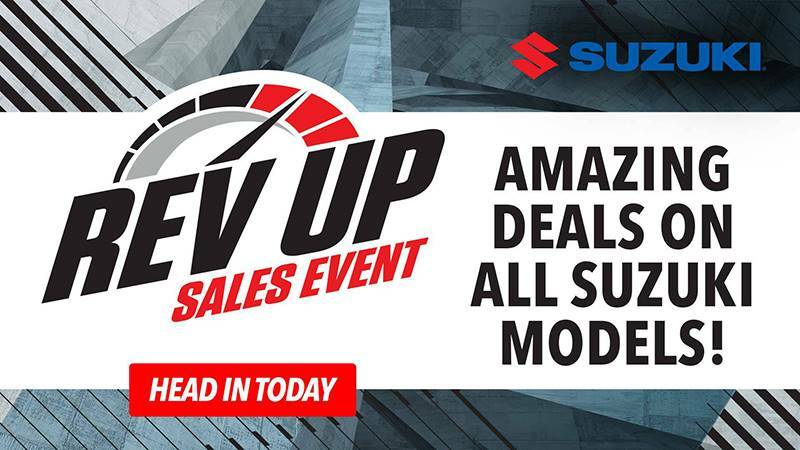 Suzuki Exhaust Tuning (SET) servo-controlled butterfly valve in the exhaust mid-pipe helps enhance torque, response, and acceleration, especially at low- to mid-rpm range. The V-Strom 1000's exhaust has a pair of inline catalyzers, up from a single catalyzer in the prior model, to achieve an effective level of emission control in the while maintaining flow to preserve engine performance. Matched to the efficient exhaust, the Suzuki Pulsed Secondary Air Injection (PAIR) system injects fresh air into the exhaust ports to satisfy a variety of US and international emission standards without sacrificing performance. State-of-the-art transistorized digital ignition system contributes to a more complete combustion by igniting the mixture at the ideal moment. Twin iridium-type spark plugs are fitted to each cylinder to provide a more condensed and hotter spark, yet last longer than convention plugs. The output of the six-speed, close-ratio transmission is managed by the Suzuki Clutch Assist System (SCAS). This system works like a slipper clutch by allowing a small amount of clutch slip to enable smooth downshifts. It also works as an assist clutch, making the clutch lever pull light and precise. Liquid-cooled, 1037cc, 90-degree, V-twin engine delivers strong engine performance while achieving worldwide emissions requirements without any reduction in horsepower. Five-axis Inertial Measurement Unit (IMU) provides vehicle spatial information to the innovative Motion Track Anti-lock** and Combined Brake System. Multifunction, illumination-adjustable instrument panel delivers a wide range of vehicle information and aids in selecting the Suzuki Traction Control System* modes. Slim fairing features vertically stacked headlights, hand-adjustable windshield, and iconic Suzuki DR-Big styling that brings true adventure, style, and real-world function. 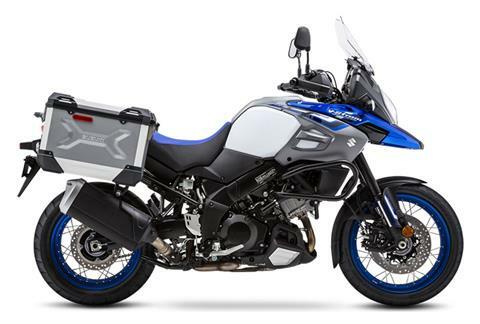 Sturdy and nimble chassis includes a rugged accessory bar, center stand, heated hand grips, and Suzuki aluminum panniers that easily clip on and off so the V-Strom 1000XT Adventure is ready for touring in seconds.